Sensory Sensitive Santa is coming to town!!! 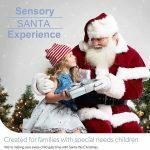 Sensory Sensitive Santa is coming Huron Valley! Join us in a sensory-sensitive setting where we will watch holiday favorites, have the opportunity to do some holiday crafts and visit with Santa (if and when ready-no pressure). Parents will be contacted to schedule a time to visit with Santa. Parents are welcome to take their own pictures during the entire event, including time with Santa. And just for fun, everyone is encouraged to wear their favorite pajamas! This event will be totally self directed, move at your own pace – time slots will be available for a private visit with Santa! Come for as much or as little time as you wish. When you arrive please check-in inside the gym.